Saturday night bomber. Cali-Belgique India Pale Ale from Stone Brewing Company. The 22 ounce bottle shows 6.9% ABV. 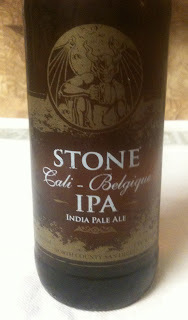 The Stone web site lists 77 IBUs. 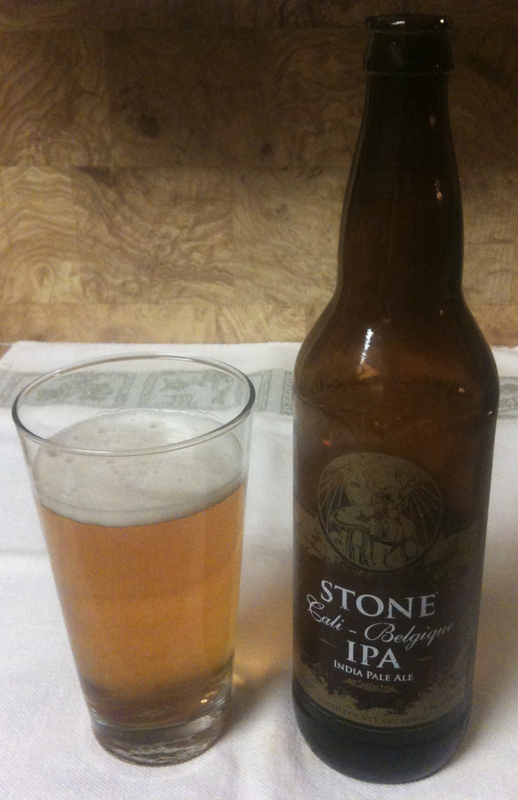 They describe it as a California-style IPA with Belgian influence - a Belgian yeast strain. This IPA poured with a small, bone colored head. The beer is very clear, and a medium to darker golden shade. There is some citrus to the aroma, but there is an underlying yeast that keeps it from being the citrusy/hoppy IPA aroma you expect. There is some spice as well; almost a clove. The taste has some bite of citrus and pine, but like the aroma, there is some yeast and spice that comes in to keep it from being a straight IPA. Medium to full bodied. A fair amount of carbonation. Somewhat dry finish. Some bitterness sticks around for the aftertaste, like a stronger IPA. Unique and tasty.